I have really gotten into cooking lately. I would say the last several months have been marked by trying out different shows on the Cooking Channel and seeing which new foods I might want to try. So far, my favorite show on that channel is French Food At Home. A lot of this new food exploration comes from the fact that I have simply gotten tired of food being a chore for me. It’s a joy when I find something that doesn’t make me sick. I have recently given up red meat when I can get away with it (having a family made of carnivores makes that difficult) and I bluntly refuse to eat any kind of pork anymore. I also quit eating fried food and dairy products. Since cutting those things out of my diet, I have been learning to enjoy meals more because I’m not so focused on feeling sick after I eat. Granted, I miss eating a big slab of ribs or digging into a quart of ice cream but thinking about how I’ll feel afterward stops me. Thanksgiving is like my Super Bowl because everything on the table is something I can eat without groaning in agony later. My family has always been rather traditional with the food we eat that day and I like it that way. Once I had Thanksgiving at a house where they served noodles instead of potatoes and I’m pretty sure I stared at my plate with a blank look in my eye before I remembered my manners. 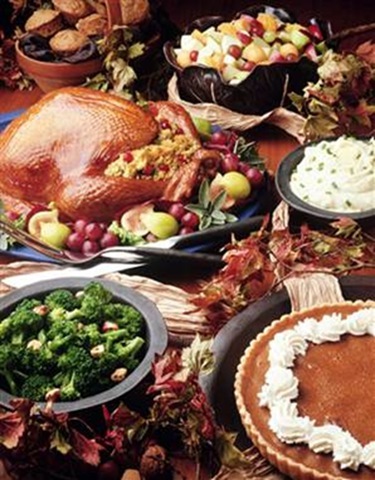 I can’t wrap my brain around a Thanksgiving menu that doesn’t feel anything like Thanksgiving. I thought I would post the menu I’m planning this year to give you some ideas about the “traditional” Thanksgiving dinner (even though some of these things were not found on Plymouth harvest feast tables). 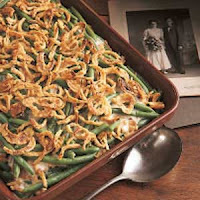 This recipe comes from the Durbin Inn, a well-known restaurant in Rushville, Indiana from the 1920s until it closed in the late ’70s. 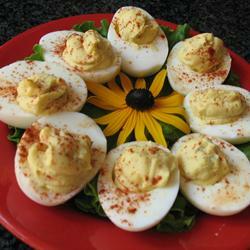 The eggs are delicious, and it’s easy to make more for larger gatherings. 1. Slice eggs in half lengthwise; remove yolks and set whites aside. In a small bowl, mash yolks with a fork. Add the mayonnaise, sugar, vinegar, mustard and salt; mix well. Stuff or pipe into egg whites. Sprinkle with paprika. Refrigerate until serving. 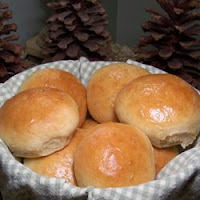 Simple dinner rolls that are easy to make. Dough is also a great base for cinnamon rolls. 1. In a medium saucepan over medium heat, warm milk, water, sugar and salt. Remove from heat, and mix in the eggs and yeast. 2. Measure flour into a large bowl. Make a well in the flour, and pour milk mixture into it. Do not stir. Cover with a lid, and let stand for 20 to 30 minutes. 3. Pour melted margarine into flour, and mix well. Add more flour if too sticky. Knead lightly. Cover, and let rise for 20 to 30 minutes. 4. Shape the dough into rolls, and place on a baking sheet. Let rise again for 20 to 30 minutes. 5. Bake rolls in a preheated 400 degrees F (205 degrees C) oven for 15 minutes, or until done. 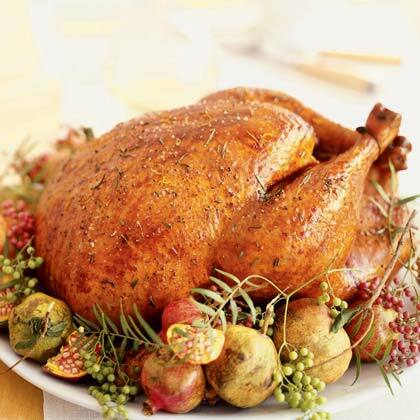 Simple, perfect roast turkey just like Grandma used to make. Seasoned with salt and pepper, and basted with turkey stock, the flavors of the turkey really stand out. Stuff with your favorite dressing. 1. Preheat oven to 325 degrees F (165 degrees C). Place rack in the lowest position of the oven. 2. Remove the turkey neck and giblets, rinse the turkey, and pat dry with paper towels. Place the turkey, breast side up, on a rack in the roasting pan. Loosely fill the body cavity with stuffing. Rub the skin with the softened butter, and season with salt and pepper. Position an aluminum foil tent over the turkey. 3. 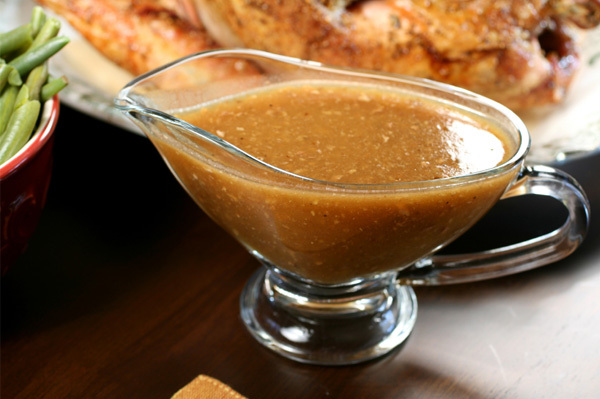 Place turkey in the oven, and pour 2 cups turkey stock into the bottom of the roasting pan. Baste all over every 30 minutes with the juices on the bottom of the pan. Whenever the drippings evaporate, add stock to moisten them, about 1 to 2 cups at a time. Remove aluminum foil after 2 1/2 hours. Roast until a meat thermometer inserted in the meaty part of the thigh reads 180 degrees F (80 degrees C), about 4 hours. 4. Transfer the turkey to a large serving platter, and let it stand for at least 20 to 30 minutes before carving. 1. Preheat oven to 350 degrees F (175 degrees C). Grease a large casserole dish. 2. 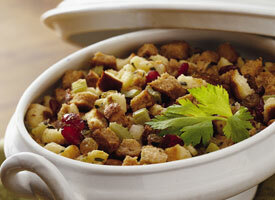 In a large bowl, mix the bread cubes, cranberry sauce, apples, raisins, lemon zest, and orange zest. Season with salt, cinnamon, and nutmeg. In a separate bowl, beat together the eggs, cider, and butter. Toss the egg mixture with the bread mixture until evenly moist. Transfer to the prepared casserole dish. 3. Bake 1 hour in the preheated oven, or until lightly browned. This ‘most requested’ side dish starts with fresh potatoes simmered in Swanson® Broth, mashed and richened with butter and cream. 1. Heat broth and potatoes in 3-quart saucepan over high heat to a boil. 3. 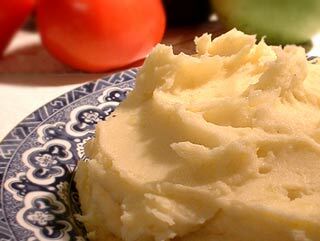 Mash potatoes with 1/4 cup broth, cream, butter and black pepper. Add additional broth, if needed, until desired consistency. 4. For an interesting twist: Stir 1/2 cup sour cream, 3 slices bacon cooked and crumbled (reserve some for garnish) and 1/4 cup chopped fresh chives into hot mashed potatoes. Sprinkle with remaining bacon. 1. Preheat oven to 400 degrees F (200 degrees C). Arrange a single layer of turkey wings in a large roasting pan. Scatter the onions over the top of the wings. Roast in the preheated oven for 1-1/4 hours or until wings are browned. 2. Place browned wings and onions in a 5 quart stockpot. Add water to roasting pan and stir, scraping up any brown bits on the bottom of the pan. Pour the the water from the pan into the stockpot. Stir in 6 cups broth, carrot, and thyme. Bring to a boil. Reduce heat to medium-low and simmer uncovered for 1-1/2 hours. 3. Remove wings from the pot and place on a cutting board. When the wings are cool, pull off the skin and meat. Discard the skin and save the meat for another use. Strain contents of stockpot through a large strainer into a 3 quart saucepan. Press on the vegetables to extract any remaining liquid. Discard the vegetables and skim the fat off the liquid. Bring the contents of the pot to a gentle boil. 4. In a medium bowl, whisk flour into the remaining 2 cups chicken broth until smooth. Gradually whisk the flour mixture into the simmering turkey broth; simmer 3-4 minutes or until the gravy has thickened. Stir in the butter and pepper. Serve immediately or pour into containers and refrigerate or freeze. This is one of my most-requested dishes, and it’s perfect for Easter, Thanksgiving, or anytime you need a fancy side dish. It looks much more difficult to make than it is, and guests are always impressed! 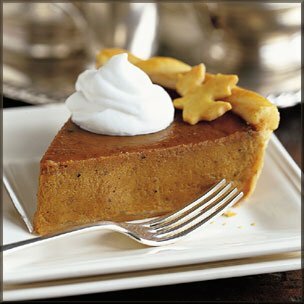 Even people who don’t like sweet potatoes ask for second helpings! I hope you enjoy it too. Maple syrup can be substituted for the vanilla extract. 1. Bring a large pot of lightly salted water to a boil over medium-high heat. Add sweet potatoes, cover, and cook until soft, about 10 minutes. Drain, and set aside. 2. Preheat oven to 375 degrees F (190 degrees C). Lightly grease a 2 quart souffle dish. Sprinkle dish with 1 tablespoon white sugar, shaking dish to evenly coat bottom and sides. 3. Place the sweet potatoes into the bowl of a food processor. Add the butter, 3/4 cup sugar, heavy cream, eggs, cloves, nutmeg, cinnamon, vanilla, and salt. Process until mixture is smooth. Pour into prepared souffle dish. 4. Bake the sweet potato mixture in preheated oven for 20 minutes. Lower oven temperature to 350 degrees F (175 degrees C). 5. 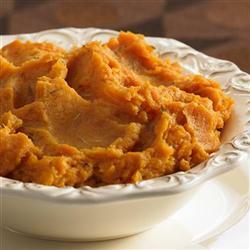 Bake the sweet potato mixture until edges are slightly browned, about 40 minutes more. Serve warm or at room temperature. 1. Stir soup, milk, soy sauce, pepper, beans and 1 1/3 cups onions in 3-qt. casserole. 3. Top with remaining onions. Bake for 5 min. more. The calories are trimmed down, but the flavor of this classic holiday dessert is awesome! 2. In small bowl mix Stevia Extract In The Raw Cup For Cup, Sugar In The Raw, salt, cinnamon, ginger and cloves. 3. In large bowl, beat eggs, add vanilla and stir in stevia spice mixture. 4. In small bowl dissolve cornstarch in 2-3 tablespoons of evaporated milk. Blend in pumpkin mixture and stir in remaining evaporated milk. Blend well. Pour into frozen deep-dish piecrust. Set on cookie sheet and bake at 425 degrees F for 15 minutes. 5. Reduce oven to 350 degrees F and bake another 45-50 minutes or until filling is set. Remove from oven and cool on rack for 2 hours. Garnish with light whipped cream before serving. 6. Serve immediately or refrigerate up to 2-3 days.